The comet is in an elliptical 6.45-year orbit that takes it from beyond Jupiter at its furthest point, to between the orbits of Mars and Earth at its closest to the Sun. Rosetta is a cornerstone mission to chase, go into orbit around, and land on a comet. It will study the Jupiter-family comet 67P/Churyumov-Gerasimenko with a combination of remote sensing and in situ measurements. The spacecraft will orbit the comet and release the Philae lander, which carries a suite of instruments for imaging and sampling the comet nucleus. The mission will track the comet through perihelion, examining its behaviour before, during and after. The spacecraft was launched from Kourou aboard an Ariane 5G+ on 2 March 2004. It required four gravity assists for its journey, one by Mars and three by Earth. Rosetta had already flown by the asteroids 2867 Steins (in 2008) and 21 Lutetia (in 2010), before entering deep space hibernation in June 2011. 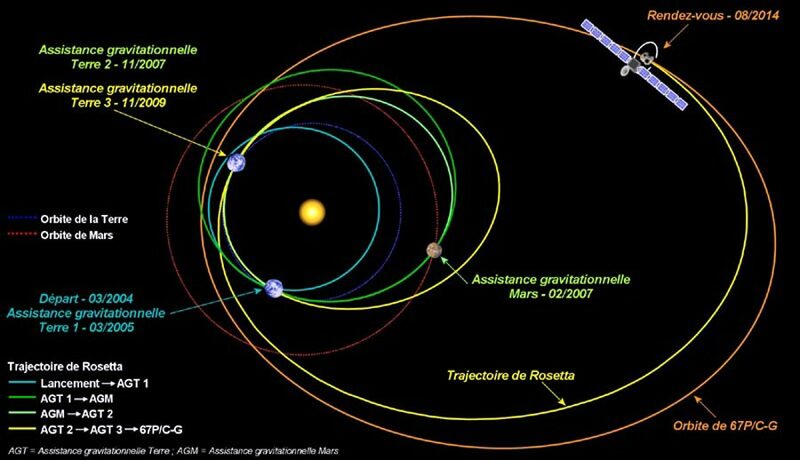 Rosetta’s main goals will be reached in 2014. Following a planned exit from hibernation on 20 January, the spacecraft’s instruments were checked as it continued on its journey to 67P/Churyumov-Gerasimenko. 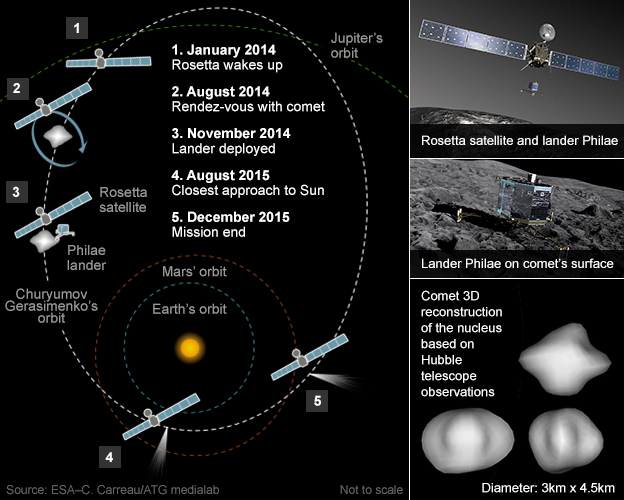 The spacecraft arrives at the comet in August 2014, and deploys the lander in November 2014. 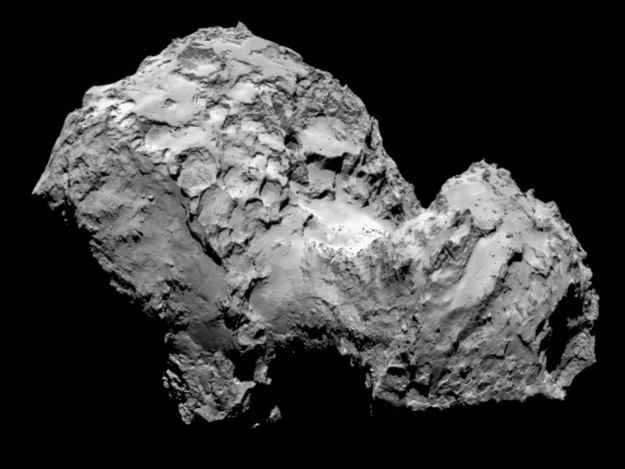 Rosetta is just 100 km from the comet’s surface, but it will edge closer still. Over the next six weeks, it will describe two triangular-shaped trajectories in front of the comet, first at a distance of 100 km and then at 50 km. The second Trajectory Correction Manoeuvre (TCM-2) of India’s Mars Orbiter Spacecraft was successfully performed on June 11, 2014 at 1630 hrs IST. TCM-2 was performed by firing the spacecraft’s 22 Newton thrusters for a duration of 16 seconds. At present, the radio distance between the Spacecraft and the Earth is 102 million km. 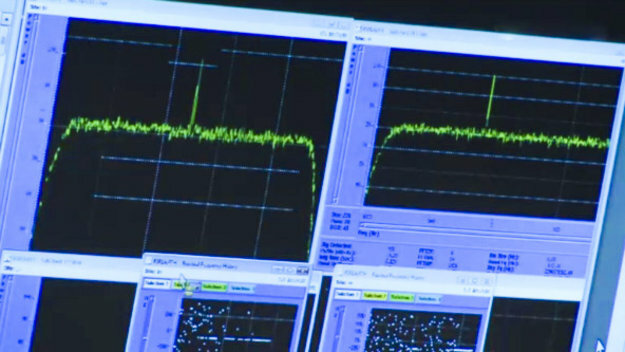 A radio signal from the Earth to the Spacecraft now takes about 340 seconds. The spacecraft so far has traveled a distance of 466 million km as part of its total Journey of 680 million km. ISRO is continuously monitoring Mars Orbiter Spacecraft using Indian Deep Space Network (IDSN). The spacecraft and its five scientific instruments are in good health. And 100 days from today on 24th September, ISRO’s “frugally engineered“ Mars Orbiter Mission (called Mangalyaan meaning Mars craft) should be inserted into Mars orbit. The highly over-rated movie “Gravity” had a larger budget at $100 million than ISRO’s $75 million for its Mars mission. China’s moon rover, Yutu (Jade Rabbit), has experienced a mechanical control anomaly, and scientists are organizing repairs. The abnormality occurred due to “complicated lunar surface environment,” the State Administration of Science, Technology and Industry for National Defence (SASTIND) said on Saturday, without giving further details. The abnormality emerged before the rover entered its second dormancy at dawn on Saturday asthe lunar night fell, according to SASTIND. The lander, another part of the Chang’e-3 probe, also “fell asleep” earlier on Friday. The pair went dormant for two weeks about one month ago when the first lunar night of the mission occurred. ….. The Chang’e-3 lunar probe soft-landed on the Moon on December 14. 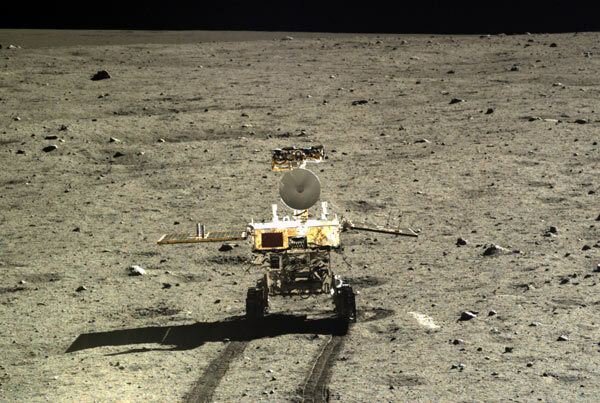 Yutu separated from the lander hours later. The success of the Chang’e-3 mission makes China the third country to soft-land a spacecraft on lunar soil after the United States and the former Soviet Union. Mysterious forces and poltergeists are at work on Mars (which in due course will be found not to be so mysterious after all). 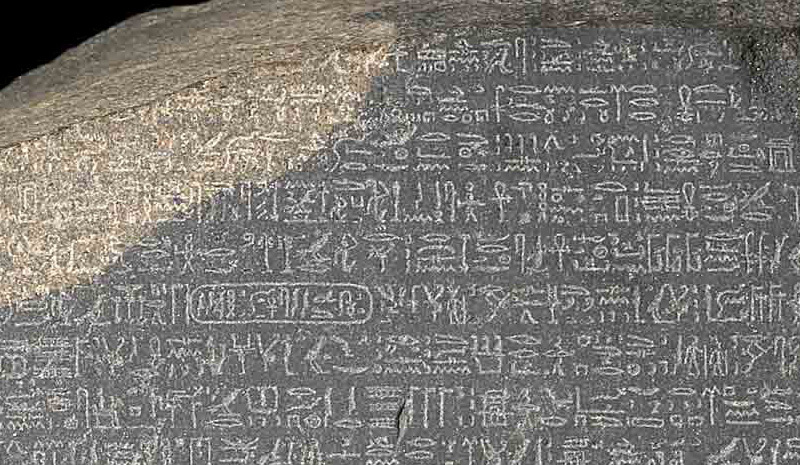 But stories about moving rocks, and possible aliens are not new. 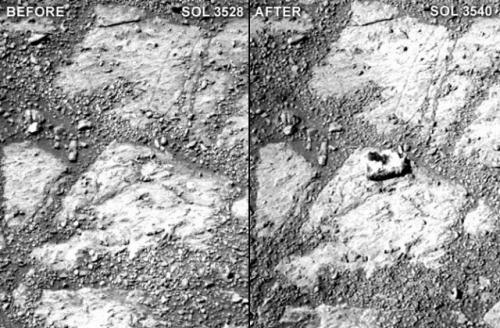 The latest however is just doing the rounds based on the pictures SOL 3528 and 3540. ….. How it got there has NASA’s best scratching their heads. Thus far, they have two main likely explanations: either the rock was tossed to that spot after a meteorite impact nearby, or far more likely, it came to rest there as a result of clumsy maneuvering by Opportunity itself. The rover is having trouble getting around these days as one of its actuators has failed. This means one wheel winds up scrapping the ground during turns, producing what Squyres described as “chatter” which he said could have caused some debris to be flung to where the rock is now. But these stories have been appearing since – at least – about 2009 (based for example on pictures SOL 1833 onwards). Moving rocks on Mars have a long history of fanciful – and some not so fanciful – notions. A whole bunch can be found here and here. But it would seem that most of the conspiracy theories and “Life on Mars” stories are connected to the selling of particular books. As far as stories are concerned, the first ever fictional account of Mars was probably Across the Zodiac (1880) by Percy Greg. But for me, The War of the Worlds (published in 1898) by H. G. Wells and Edgar Rice Burroughs and his Martian Trilogy – published between 1912 and 1943 and which I first read in 1959 – are not easily surpassed. The European Space Agency will try and wake-up its sleeping Rosetta spacecraft on Monday at 1000 GMT. 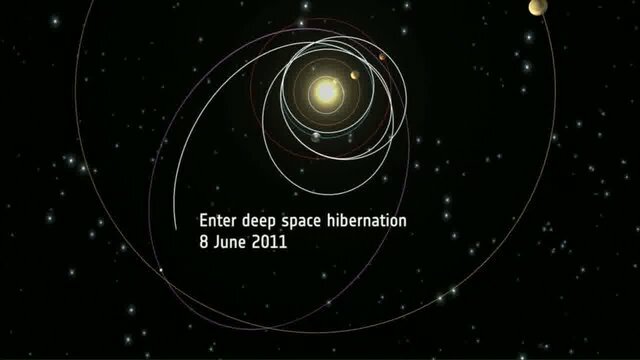 The spacecraft entered deep space hibernation in June 2011 when it was too far away from the sun to capture much solar energy. If this works it will be a considerable achievement considering that Rosetta was launched 10 years ago and the communications technology on board is effectively at least two “generations” old! NASA keeps track of all the debris in orbit. About 13,000 known objects are bigger than 10 centimeters in diameter and there are more than 100,000 pieces of orbital debris between 1 cm and 10 cm. Pieces smaller than 1 cm number in the tens of millions. All pieces of debris larger than 10 cm are carefully tracked using radar and telescopes. Many schemes have been proposed for trying to get rid of space debris orbiting the Earth. The schemes have ranged from space harpoons, clouds of of ballistic gas, housekeeping, robotic satellites and laser cannon. The Japanese have a plan for an electrodynamic tether to be attached to the debris by a robot arm. the tether then generates an electric field as it orbits around the Earth and the magnetic field then encourages the debris to drop into lower orbits and eventually burn up. A tether is going to be sent up into space at the end of February for a trial. SpaceDaily: Researchers at The Japan Aerospace Exploration Agency (JAXA) have developed what they called an electrodynamic tether made from thin wires of stainless steel and aluminium. The idea is that one end of the strip will be attached to one of the thousands of dead satellites or bits of rocket that are jamming up space and endangering working equipment. The electricity generated by the tether as it swings through the Earth’s magnetic field is expected to have a slowing effect on the space junk, which should, scientists say, pull it into a lower and lower orbit. Eventually the detritus will enter the Earth’s atmosphere, burning up harmlessly long before it has chance to crash to the planet’s surface. “The experiment is specifically designed to contribute to developing a space debris cleaning method,” said Masahiro Nohmi, associate professor at Kagawa University, who is working with JAXA on the project, told AFP. Nohmi said a satellite developed by the university is expected to be launched into space on February 28, with the tether aboard. “We have two main objectives in the trial next month,” he said. “First, to extend a 300-metre (1,000-foot) tether in orbit and secondly to observe the transfer of electricity.” The actual reeling in of orbiting rubbish will be the objective of future experiments, he said. A spokesman for JAXA said the agency also plans to conduct its own trial on a tether in 2015. More than 20,000 bits of cast off equipment, including old satellites, pieces of rocket and other fragments are uselessly orbiting the Earth in a band 800-1,400 kilometres (500-900 miles) from the surface of the planet at terrific speed. If we are able to calculate the motion of debris, we can attach a propulsion system for removal. As the propulsion system, we have envisioned an “electrodynamic tether”, which is extremely efficient because it does not require fuel. The end of an electrically conductive cord (tether) is attached to the debris, transferring it to a lower orbit through the Lorentz force generated by the interference between Earth’s magnetic field and the current flowing through the tether, causing it to re-enter the atmosphere. Two methods are being considered for attaching the tether. One is a method of using a robot arm, for example, to hook the end of the tether into a 1-meter-diameter hole in a payload attachment fitting used as a base for mounting the satellite onto the rocket. Another is a method where the side of the rocket stage, which is extremely thin for reduced weight, is approached and harpooned by the tether end to attach it. This method is considered to be a safer operation since the tether can be attached from a distance of 10 to 20m. After a flawless launch of the GSLV-D5 using an indigenous cryogenic engine for the first time, it now remains to insert the GSAT-14 satellite into its operational orbit. In three orbit raising manoeuvres, using the Liquid Apogee Motor, on board, GSAT-14 will reach the intended circular Geo-stationary orbit. “It is a tough job to understand and master cryogenic technology. It is ultimate and we have put in a lot of efforts and made it possible. Today, we can say and prepare with more confidence for the next mission of C-25 stage with 25 tonnes of propellant and 20 tonnes of cryogenic engine thrust for the GSLV MK-3 D-1 mission in early 2017. The high-end cryogenic engine is slated for completion and testing by 2015,” Vikram Sarabhai Space Centre director S Ramakrishnan told TOI minutes after the lift-off of GSLV-D5. Countdown Operations are underway at the Satish Dhawan Space Center on India’s East Coast from where a Geosynchronous Satellite Launch Vehicle will launch on a demonstration flight on Sunday at 10:48 UTC. GSLV is carrying the GSAT-14 communications satellite to Geostationary Transfer Orbit. Chang’e 3 landed on the moon on Saturday and her Jade Bunny has now started gambolling on the moon. Xinhua:China’s first moon rover, Yutu, or Jade Rabbit, separated from the lander early on Sunday, several hours after the Chang’e-3 probe soft-landed on the lunar surface. The 140 kg six-wheeled rover touched the lunar surface at 4:35 a.m., leaving deep trace on the loose lunar soil. The process was recorded by the camera on the lander and the images were sent to the earth, according to the Beijing Aerospace Control Center. After the separation, the rover and lander will take photos of each other and start their own scientific explorations. Engineers made final checks of the environment of the landing site, the situation of the probe and the solar incidence angle late night on Saturday and sent signals of separation to Chang’e-3. Yutu, atop the probe, extended its solar panel and started to drive slowly to the transfer mechanism at 3:10. The transfer mechanism unlocked at 4:06 with one side reaching the moon’s surface, allowing the rover to descend to the surface following a ladder mechanism. Chang’e-3 landed on the moon’s Sinus Iridum, or the Bay of Rainbows, at 9:11 p.m. Saturday, making China the third country in the world to carry out such a rover mission after the United States and former Soviet Union. In ancient Chinese mythology, Yutu was the white pet rabbit of the lunar goddess Chang’e. The name for the rover was selected following an online poll that collected several million votes from people around the world. The rover, 1.5 meters long with its two wings folded, 1 m in width and 1.1 m in height, is a highly efficient robot controlled by the command center from the earth. It will face challenges including temperature differences of more than 300 degrees Celsius on the moon. Yutu will survey the moon’s geological structure and surface substances and look for natural resources for three months, while the lander will conduct in-situ exploration at the landing site for one year.